Gritty and atmospheric, this drama blends a crime story with the more earthy, grim genre of films like Winter's Bone. It's strikingly well written and directed, with a steely edge that makes the characters easy to sympathise with, even when they make bad decisions. 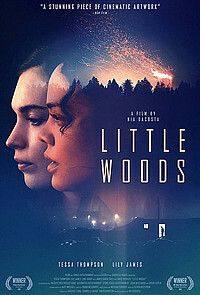 This is a fine collaboration between filmmaker Nia DaCosta and her leads Tessa Thompson and Lily James as sisters navigating cruel circumstances. In North Dakota, Ollie (Thompson) works hard to make ends meet, resisting pressure to return to dealing opioids with Bill (Kirby). At the end of her probation, her parole officer (Reddick) encourages her to make a fresh start. Meanwhile, Ollie's sister Deb (James) has no idea how she and her young son (Reid) will survive now that she's pregnant again by his father Ian (Dale). Now Ollie and Deb have a week to raise $3,000 to avert foreclosure on the family home. So Ollie turns to Ian with a plan for one last drug deal. Strikingly photographed by Matt Mitchell in big-sky locations and bleak interiors, the film pulls the audience in through both personal drama and more intense plot turns. The house, where Ollie nursed their mother as she died, becomes almost a character in the story, shot in snaky long takes to reveal the limits of Ollie's world. So it's heart-stopping when Deb calls Ollie on her holier-than-thou attitude. This is a great role for Thompson, who digs deep to create a complex young woman doing her very best, even though the cards seem stacked against her. In a smaller role, James also has some very strong scenes, finding textures to Deb that make her much more than a hapless victim of circumstances. Both of these young women are feisty and intelligent, only limited by the opportunities they've had and the demands made on them. By comparison, Kirby and Dale are solid as men who don't worry about the nasty decisions they make. There are hard corners everywhere in this story, as these two young women struggle every step of the way. But DaCosta, Thompson and James manage to avoid letting the film become hopelessly bleak. Even with major setbacks, there's a sense of purpose and determination. so like Ollie and Deb, the audience never gives up on the situation. That said, there are no easy answers, no simple moralising and it becomes fairly sure that survival is the best possible outcome in a place where there are no happy ever afters.